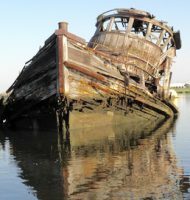 You are currently browsing the daily archive for December 2, 2006. Ports Elizabeth and Newark handle most of container traffic in the “port” called Greater New York. All tallied, the traffic was estimated to value over $130 billion in 2005. 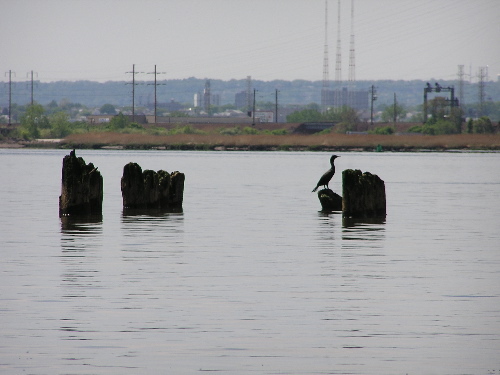 Elizabeth and Newark lie along Newark Bay. A remarkable aspect of the Port is the juxtaposition of natural and human industrial. Maybe a better way of expressing this is just that nature–in these photos specifically bird life–adapts to transformations in the environment. 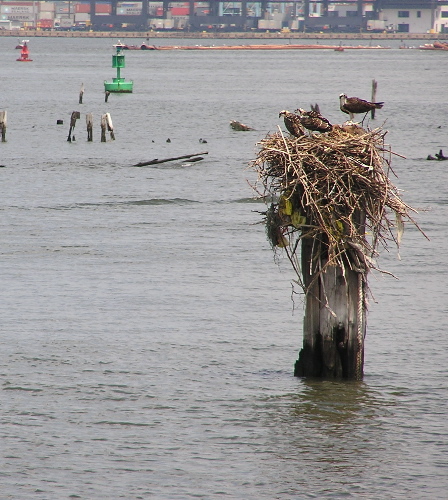 Newark Bay is not only shipping, the Skyway is not just habitat for cars, and the meadowlands is not wasteland or sports complexes. 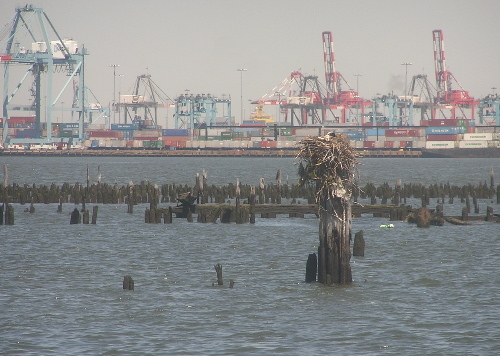 At the southern entrance to Newark Bay is Shooter’s Island, and at the east end of Shooter’s is this osprey nest. Going north from Newark Bay the water diverges into the Passaic and the Hackensack. 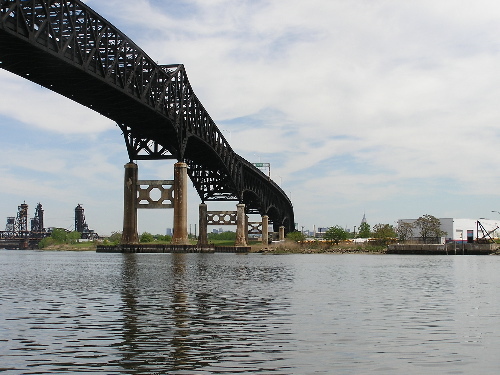 Spanning both these rivers is the Pulaski Skyway, which peregrine falcons use as a hunting platform. This is under the Skyway, looking east. At the east end about halfway between the bridge and the white building, notice the top of the Empire State Building. Now let’s continue northward on the Hackensack into the meadowlands. Three centuries ago this was a freshwater river covered with a cedar forest. Because the “impenetrable” forest served as cover for pirates who operated on New York harbor, the government gradually burned down the forest. The fires were just the first step in the abuse of the meadowlands. 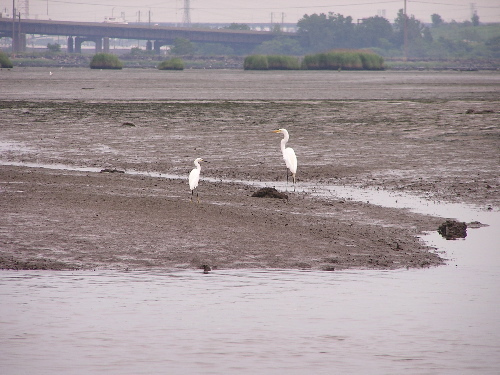 Here egrets feed on a tidal flat just northwest of Laurel Hill (aka Snake Hill) looking south toward the I-95 bridge and Kearney.